Why Is It So Hard Letting Go? Back about seven or so years ago I boxed up all my homeschool supplies and packed them away in the basement. That’s not to say that I stopped homeschooling, but the supplies I finally put away were the Pre K – 4th or 5th grade stuff. This amounted to nearly 30 plastic bins of stuff. This might sound like a lot of stuff, but my situation was not typical of a homeschooler. Having a son with Down Syndrome I tried anything and everything when it came to teaching him. If one workbook didn’t work, I bought another. If one manipulative didn’t hold his interest, I found others to try. 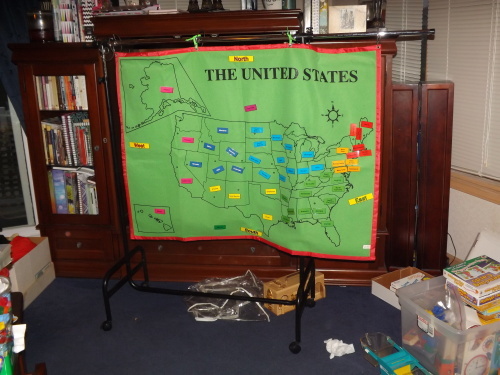 My home was better equipped with teaching materials than most public school classrooms. With the addition of our new freezer in the basement, although I made a space for it, I decided it was time to start parting with my homeschool materials. This would free up some much-needed space and get rid of lots of clutter. Even though the bins were stored out-of-the-way, having them still gave me a sense of clutter. I justified holding onto all this stuff by claiming that perhaps some day Grace might want to homeschool her children. Grace is 19 and although she likes the idea of homeschooling her children someday when she has them, she is a very different person than I am. I wouldn’t say she is lazy, but she isn’t motivated either. I had a long conversation with her recently about this and I can see that she is pulling away from the homeschool choice already because she doesn’t want the work or responsibility that goes along with it. I can understand her point of view, as many times I was overwhelmed with the homeschooling aspect of our lives, but at the same time I wouldn’t change those years for anything. This will have to be a choice for Grace to make and if she does decide to do it, she will do it her way, not mine. So over the long weekend I began pulling out a few bins of teaching materials and taking pictures of them to put up on Craig’s List. As I started sorting through the hundreds (and this is no exaggeration) of workbooks I have, I found myself setting aside certain ones that I remembered really liking. These were in the keep pile. The rest went in the sell pile, which was substantially bigger. I posted five ads/five items in three categories each and then decided that perhaps a bulk ad advertising just “Homeschool, Teaching and Teacher’s Resources” would be better. It would be tedious to list each item individually. Bright and early yesterday morning I received a phone call from a woman who saw one of my ads. She wanted to come by and take a look at everything I had. I asked her what she specifically was interested in and she said “EVERYTHING!” My heart began to race. I was thrilled or something, I wasn’t really sure. I told the woman that I would pull out more bins for her to look through and see what she was interested in and we made arrangements for her to come by later in the morning. 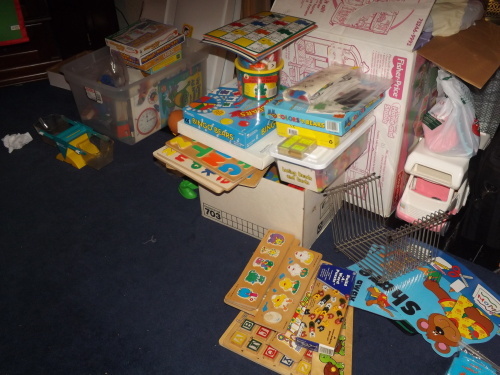 A few hours later the woman and her four little girls were seated in my great room looking through binders of workbooks, boxes of puzzles, stacks of books, and bin after bin of manipulatives and teaching aids. I have everything priced to go. workbooks are from $1 to $3 depending on the size of the binder they are in. All of my workbooks have had their bindings removed and been put in either a binder or file folder for easy copying, no writing in them whatsoever. Wood puzzles were $1 for small to medium and $2 for large. Books were $.25 each for readers – but I didn’t even bring up the 1000 books I still have in the basement. Manipulatives were from $5 to $15 depending on how much I know I paid for them which is at least 3.5 times those prices (teaching materials are not cheap). The woman filled six boxes with stuff and ended up spending $200. Zeb and I packed the stuff away in her car and she asked me to contact her again when I pulled out more stuff. In all, I probably had pulled out about 1/3 of what I have. 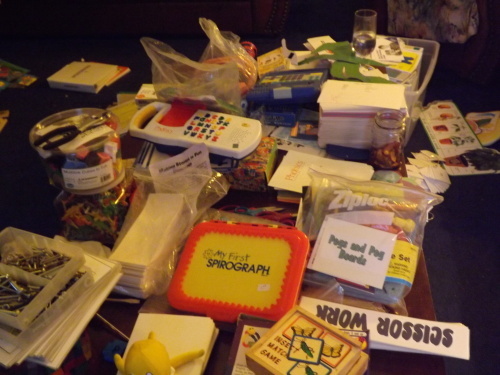 She didn’t buy everything, but she took nearly every workbook, quite a few puzzles, several stacks of readers, four different types of sorting, lacing, manipulative type sets, a videoscope lab, and bug collection. After she left I sat on the couch looking at the empty spaces in the great room holding my money. It was a weird moment. I was happy to see my stuff going to a home where it would be used, but at the same time, there was this funny feeling in my stomach. Hubby came home shortly after the woman left and was very excited that we’d sold so much. His excitement encouraged me, so after he left for work again a few hours later, Zeb and I once again headed into the basement to pull out more bins. I finished clearing out one storage room (another five bins) and then we went into the pantry and pulled another seven bins from there. 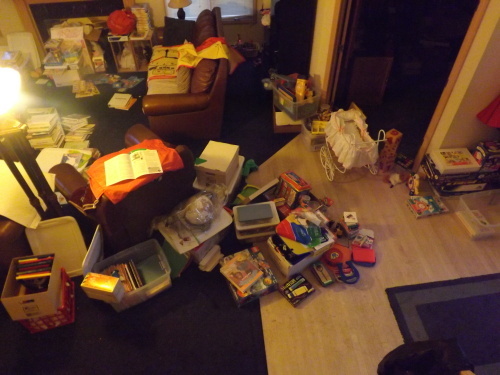 I brought everything upstairs and began sorting through everything. 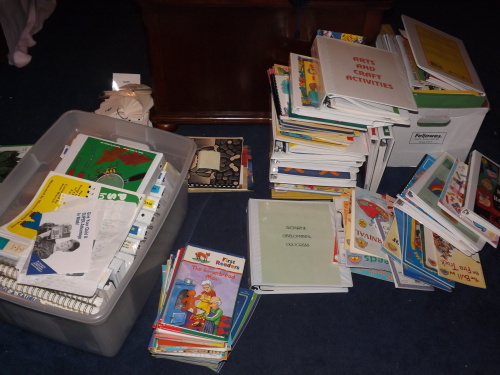 This time, as I sorted through all the workbooks though I noticed something, the pile to “keep” was increasing three or four times faster than the “sell” pile. Very quickly I had four bins of workbooks that for some reason I just could not part with. This was not to mention the four boxes of file folders in the basement I’d already eliminated from the selling option before even bringing them upstairs. Why was this suddenly so hard to do? Why was I holding onto even one of these workbooks? It’s not like I’m going to use a Pre-K Numbers Workbook or Second Grade Math text-book, and even if there were ever an occasion for me to use or need such a thing, there is no reason I couldn’t go online and pretty much find anything I needed. Still, that funny feeling in the pit of my stomach was turning into an ache and then an anxiety-ridden struggle. I want the extra space and all the clutter gone, but after watching that woman walk out of here with so much of my “stuff” that I used for so many years with my children, I feel an emptiness that is choking me. Probably the best thing to do would have been to just take the bins out of storage and get rid of them without opening them, but I couldn’t do that. I had to organize everything again, make sure everything had every piece, and even clean some things. Touching every piece brought back so many memories and thinking of these gone is really hard. It looks like — No words! Just a MESS! These are just some of the workbooks I have. There are two more bins of ones to sell and of course the bins I have hidden away in the office. I have five other accessory-type charts for this thing! I can’t even find my coffee table under all this stuff. I don’t know what to do. 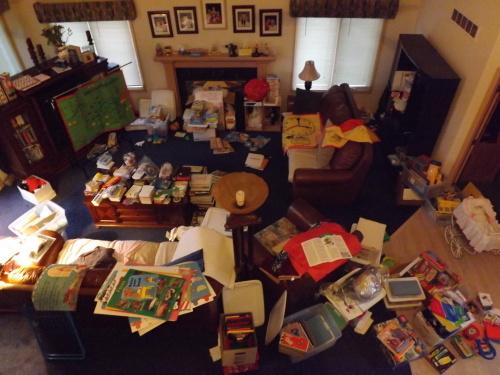 I am so afraid of regretting getting rid of all this stuff — but at the same time, it’s only stuff! Hubby pointed out to me when I began pulling all this out that it would be nice to make some of our money back on all this stuff, but as long as I got what I wanted from it, donating was an option. If I do donate it will have to be to a school for special needs children because that is where I would really like to see this stuff utilized, although I don’t know that they would even want it. Just giving it away and not knowing that it will be put to good use is not something I’m comfortable with right now. Getting rid of it period is not something I’m comfortable with right now. I’m not sure if I should email the woman who was here yesterday to come by or contact another person who emailed me last night about my ad. I bet I could sell every one of my workbooks, even the ones I have locked behind the office doors, but how can I do this? I have a rule that I try to hold myself to: Once something is brought up from the basement to get rid of, it doesn’t go back down. This has served me well when getting rid of other things, so when it wasn’t sold it was either thrown away or donated. There is no way I can leave my great room the way it is. Something has to be done, just what? At the moment I’m at a loss. Grace made me a fresh pot of coffee, the weather is rainy and humid, but supposed to get cooler sometime today, and Bell needs to get out for a walk before I’m brought up on charges of dog neglect because she’s been homebound for so long because of the heat and humidity. I think I’ll get dressed and take her for walk to clear my head, come home and have a fresh cup of coffee, and then maybe my perspective will clear — and for this, I am trying to be Simply Grateful. I’m sitting here this morning, in bed, after getting up at 5:45 to pack Grace’s lunch for college, counting the hours until it is supposedly going to start raining. The temperatures have been well into the upper 80’s low 90’s for what seems like weeks (actually only about two weeks) and the humidity is unbearable. I have been locked away in the house afraid to even open the doors for fear of being consumed by the heat. Rain is predicted for later today and with it they are promising cooler weather, lower 70’s actually and for the next 10 days it looks like the air conditioner will get a much-needed reprieve. Even though, I can’t get motivated to do much of anything today. I was inspired making Grace’s lunch this morning though. I am definitely a morning-type person. Getting up early doesn’t bother me, as long as I’ve gone to bed at a descent hour, gotten enough sleep, and am not woken by an annoying alarm clock. I by no means like to stay up late. I go to bed no later than 10, but more often than not, earlier than that. In fact, most nights I try to get up to my room and into bed to relax by 8, of course the family isn’t so cooperative. Falling asleep is easy; staying asleep, well that is an entirely different matter. It takes me all of 10 minutes of watching television in my room to calm down and start drifting off to sleep. Come 1, 2, or possibly 3 a.m. though, I wake and toss and turn for an hour or three, fall back to sleep and then wake again right before 6:00. If I need to get up any earlier, my alarm is set, but I just hate that ringing in my ear, so whenever it is set, my internal clock will typically wake me a few minutes before it rings. Anyway, back to Grace’s lunch. Yes, I make lunch for my college bound daughter. Actually though for the past couple of years she wanted to be “independent” and make her own. About a month ago however she came to me and sheepishly asked if I would be willing to make/pack her lunch as well as dinner (just one day) to take with her to school each day. This is her first semester at a University, as she completed her Associates at a local community college and she is nervous about how this is going to be more stressful of an endeavor. I told her I would. Not making her lunch while she was working over the summer or when she went to community college did bother me a bit. Letting go of something as little as that shouldn’t really be a big deal, but it was. After having her home for so many years and making her lunch day-in and day-out, the transition I knew was just the beginning of her independence. Her asking me to make her lunch again was a subtle reminder that although a woman, Grace is still my little girl. She still needs me. Albeit she only needs me on her terms, but at this point I will take what I can get. All too soon she will be off and out in the world leaving poor ol’ ma sitting home waiting for her to call and share her life with her (very melodramatic here!). As I pondered what to make her for lunch this morning at 2:30 as I waited for my second round of sleep to commence, I decided to make her something really good…something that she would never take the time to make for herself. Isn’t that what a mom is supposed to do? 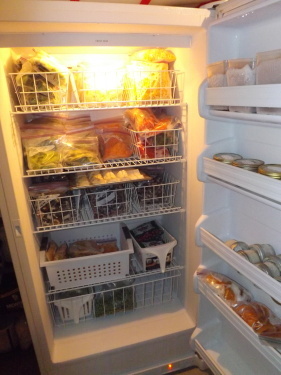 With Grace my options were pretty much anything and everything, because even when she did pack herself lunch and snacks, it mostly consisted of prepackaged stuff that she could just quickly toss in a bag with a peanut butter and jelly sandwich and go. That isn’t my style. I have been making Zeb’s lunch for the past two years that he’s been going to school (homeschooled him up until then) and only on days when I absolutely had nothing else to send with him, did he get something prepackaged. There are a few things he does like that are prepackaged — fruit snacks, pretzels, etc., but really I try to stay away from most others. Grace’s schedule is a bit different from Zeb’s when it come to school though. Although today I only needed to make her one “meal” (lunch), she is going to be at school from 7:00 until probably 3:00. This leaves lots of time in between breakfast and lunch and then lunch and dinner where she is going to want something to eat. Snacks are an essential part of her day even when she’s at home. How she can eat so much, so often, and be as thin as she is, I’ll never understand. I just think about eating the amount of food she does and I put on weight. Lunch: Taco Salad (I bought a food thermos to keep things warm and used it today to keep the taco meat hot, made a salad with cheese and vegetables in it, and put tortilla chips, salsa, and sour cream on the side) — a hot meal. For dessert she can eat more of the fruit, as there was quite a bit I sent her or she has a couple of homemade cookies. Mid-Afternoon Snack: Carrots, Radish, Cucumber, Yellow Pepper and Broccoli with homemade ranch dressing. Of course she also has fruit snacks, veggie straws, granola bars and a few other “just-in-case-of-an-emergency” type snacks packed in the cooler in the back of the car should she still get hungry. All the comforts of home, but not at home. Yep, she’s in college — university actually, and yet she still gets a thrill out of competing with everyone as to whose got the best lunch. Probably because she never got to do this as a kid because she never went to public school. That’s okay, it made me feel good that she was so happy. I like having the opportunity to do something special for her. It takes some of the pressure off of her to be an adult, gives me peace of mind that she is eating healthy, and at the same time affirms that I am still needed–something that every mom needs on occasion, and for this I am — Simply Grateful. Having a son with special needs can be challenging, heart-wrenching, bittersweet, and sometimes just downright difficult. Yet, most of the time I’d have to say it is no different than having a “normal” son. Although I have never had a “normal” son, my daughter does not have special needs so based on my experience with her, Zeb is “normal” in most senses of the word. Probably one of the most difficult aspects of having a son with Down Syndrome is watching how other people react to him. Supposedly our society is now being conditioned to be “tolerant.” What is that, really? Well, from my experience I can tell you that tolerance when it comes to Zeb means ignoring or avoiding him. When this isn’t the case, he endures staring, pointing, laughing, or worst of all that “pity” look with a little shake of the head. I also just love it when I get that “look” from people as if they “understand.” They understand nothing. Unless they have had a child with a handicap, and even then every one of our experiences are different, they have no idea what life is like for a person with a disability, let alone the family that takes care of them. Zeb though is very lucky. He does well for himself. Although we do not believe he will ever be able to live on his own completely, he can go out to movies by himself and nearly every Saturday night I drop him off at Barnes & Noble where he sits in the cafe for about two hours listening to his iPod, drinking pop, and enjoying some independence away from mom and dad. Many young adults his age with special needs will never be able to do even these seemingly simple independent acts. When I drop Zeb off at the bookstore, he goes in by himself, finds a table, and gets himself settled. I do not go in with him or even check on him until I pick him up a few hours later. He has a phone that he can call me on if he has any trouble, but (knock on wood) for the past several years he has not had occasion to do so. For the most part there have never been any problems leaving him by himself. Once or twice when I picked him up he was quiet and withdrawn. When I talked to him about it I found out that either people at another table were staring at him making him uncomfortable or teenagers had made rude comments to him. I comforted him and explained that some people are just mean or rude and tell him to do his best to ignore them. What else can I do? The world is not going to change and I cannot expect it to. I have done my best not to force my son on the world, but at the same time I don’t think it is fair that I keep him locked away. He has a right to experience as much of life as he can, regardless if people accept him or not. Fear is a terrible thing. It hinders a persons ability to think, reason, and understand. There is nothing worse than walking through a store with Zeb next to me and watching as a mother grips the shoulders of her child and pulls them far out of our path, as if their child might catch “it.” Thankfully Zeb doesn’t understand their actions or pretty much even notice. A case where ignorance is definitely bliss. There are occasions, wonderful occasions though when a person will come up to Zeb and strike up a conversation or stop him to comment on how nice he looks. This absolutely makes Zeb’s day/night and he floats on Cloud 9 for hours and remembers these experiences for days. He refers to the people that take the time to acknowledge his existence as his buddies or even friends. At Barnes & Noble there are several “regulars” that Zeb sees week after week and some of them have taken to stopping by his table, shaking his hand, asking him how he is, and engaging in conversation with him for a few minutes. They are sure to say goodbye to him when I pick him up and smile and tell me to have a good night. No pity, no fear, no tolerance, no difference. These experiences touch me and prove that there is understanding and acceptance out there. He just shook his head and began putting his iPod away. I went on and told him that I’d fix it for him, but I didn’t know how to tie a tie, but I would go on YouTube next week and figure it out so this wouldn’t happen again. The man was in his early 20’s, from the books and papers on his table I assumed a college student, and by himself. He stood up and accepted the tie that Zeb had removed from his neck and handed to him. 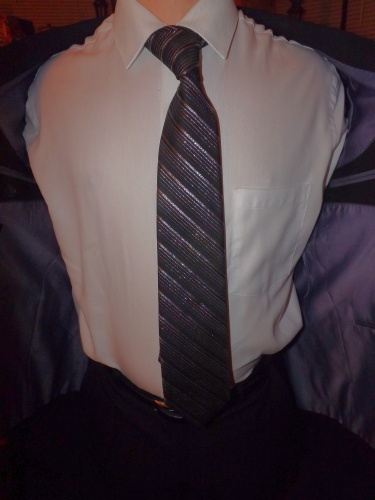 The young man put the tie on his neck, over his t-shirt, and began tying it. It took him two tries to get the lengths of the tie right (this tie is very difficult to judge because it is a thicker tie) then carefully loosened it from his neck, pulled it over his head, and helped Zeb fix it back around his neck. This random act of kindness that young man performed for Zeb means more to him than anyone could possibly understand. The first thing he did when we got home was to run in the house and show Hubby how his tie looked. Hubby looked at it and said, “That’s not how I tied it.” Hubby had tied a Windsor knot and the young man hadn’t. I explained to Hubby what had happened. Hubby told Zeb to take the tie off and offered to retie it. Zeb grabbed onto the tie and held it close to his chest defensively and flatly said, “No.” To Zeb, that tie will never need to be retied. He will leave it tied as the young man tied it because it meant that much to him. What that man did for Zeb goes much deeper than just tying a tie – he treated him with kindness, with compassion, with respect, things that Zeb never takes for granted. This made Zeb’s night, and probably his whole week. For me this act will be something I remember always because for one moment Zeb wasn’t ignored, pitied or feared, he was accepted for who he is and seen as a person – not as someone with Down Syndrome, and for this I am forever – Simply Grateful. 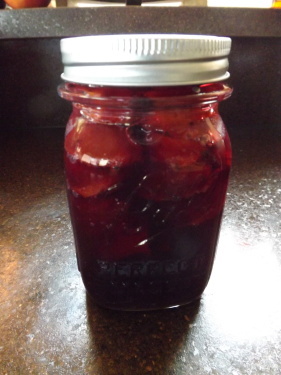 With plum season finally behind me, I wanted to update the Fruit Page on my Simply Grateful Canning site. Although the Recipes Page here at Simply Grateful Housewife has not been updated recently, I am going to try to play catch-up there as well. 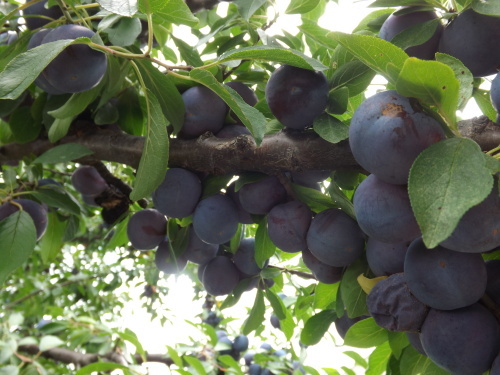 In the meantime, for a complete listing of all the Plum Canning Recipes on both Simply Grateful Housewife and Simply Grateful Canning, check out the updated Plums Page at Simply Grateful Canning. It is hard to keep on top of organizing all my posts and recipes, hopefully if I start early on my new sites, I won’t fall as far behind or behind at all. It feels good to be organized, and for this I am — Simply Grateful. Yesterday I read a post at This Abundant Life on Pretzel Sandwiches that made it impossible to have anything else tonight for dinner than something with pretzel rolls. Although I would have just loved to run out and pick up some pretzel rolls, when I checked at Aldi, they didn’t have any. Not wanting to run around looking for them, I did the next best thing, I decided to try to make them myself. This afternoon I spent about an hour working on the recipe and although my first attempt tasted great, the looks left lots to be desired. 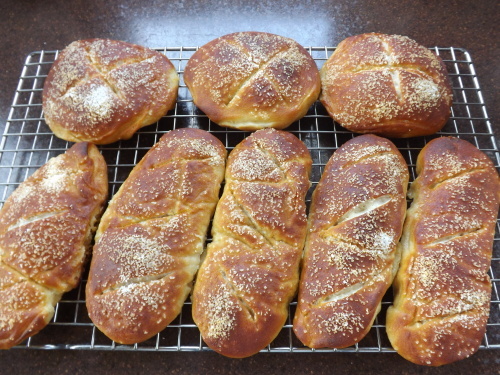 For the complete story, check out my post on Simply Grateful Cooking Pretzel Rolls – Success and Failure All In One. This picture doesn’t show how flat my rolls are, but take my word for it, there’s no using these for hot dogs. I’m not going to give up on making my own pretzel rolls, but this has been a bit of a disappointing day. Still, I will chalk this little set-back up to experience and push forward to not make the same mistakes next time and we are definitely going to enjoy eating my mishap, so for this I am — Simply Grateful. 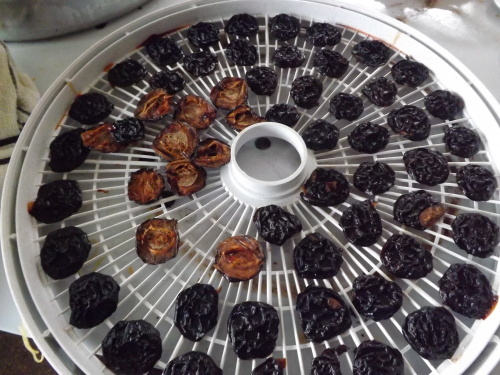 No More Pitting, No More Plums, Finally All The Plums Are Done! 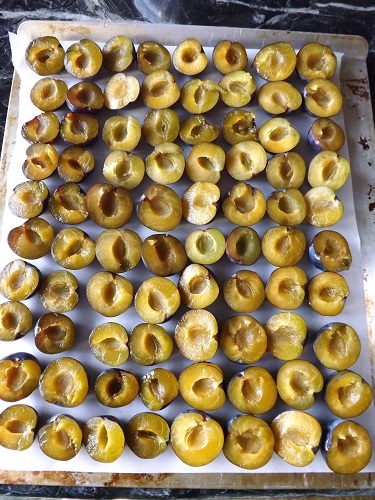 It has been a long road, but the final plum canning project for 2015 is complete and stored safely in the pantry. Check out Brandy & Spice & Everything Nice Plums at Simply Grateful Canning. 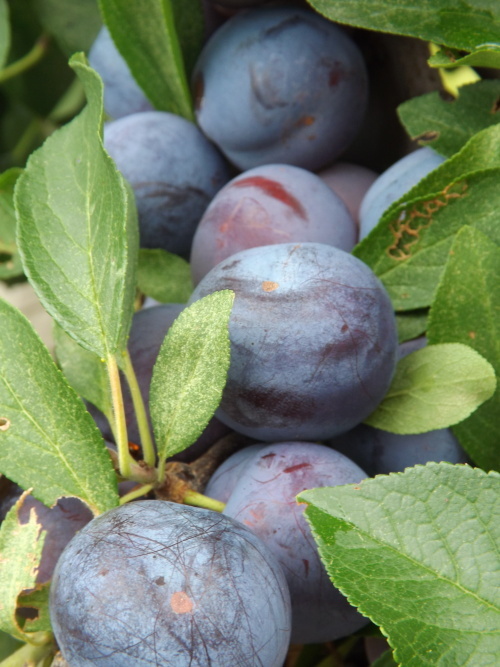 It doesn’t seem possible that I will not have to pit another plum for an entire year, or at least not any Damson plums. Who knows what I might find when I’m at the Farmer’s Markets in the coming weeks. Even though I have plenty of home-grown goodness to concentrate on, I still have to check out whats new at the local farms around me. Call it an obsession, but I just can’t resist. At least with all the plums that were piled up no longer dominating my time, I can stop and take a moment, albeit a brief moment, to catch my breath. There are peppers, peaches, tomatoes, and beans still to can, but for now all I want to think about is: I’m done with plums, and for this I am — Simply Grateful.